We’d love your help. 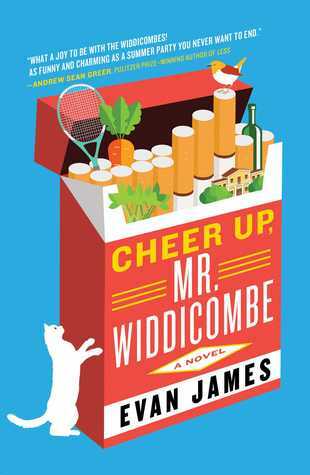 Let us know what’s wrong with this preview of Cheer Up, Mr. Widdicombe by Evan James. To ask other readers questions about Cheer Up, Mr. Widdicombe, please sign up. Thanks to Atria Books for an advance review copy of this book in exchange for a fair and honest review. Cheer Up, Mr. Widdicombe lands in store on March 26th, 2019! There's something morbidly satisfying in reading about the lives of the wealthy few. Cheer Up, Mr. Widdicombe is populated by one such family, who live in the pleasant Pacific Northwest, but they all happen to be down in the dumps despite their financial advantages. The titular Frank Widdicombe is malingering after his friend cancelle Thanks to Atria Books for an advance review copy of this book in exchange for a fair and honest review. Cheer Up, Mr. Widdicombe lands in store on March 26th, 2019! There's something morbidly satisfying in reading about the lives of the wealthy few. Cheer Up, Mr. Widdicombe is populated by one such family, who live in the pleasant Pacific Northwest, but they all happen to be down in the dumps despite their financial advantages. The titular Frank Widdicombe is malingering after his friend cancelled their annual trip to France in order to attend a wedding, while his wife Carol bemoans what she assumes is her husband's decline into clinical depression. Their son, Christopher, is a watercolorist stifled by his parents' endless acceptance of his homosexuality who mourns a love lost in Europe. Into their house is welcomed pleasant assistant Michelle, drug-addled aspiring playwright Bradford, self-help guru Gracie, and gardener, Marvelous Matthews. I was expecting humour along the lines of Arrested Development, or perhaps Wes Anderson-infused quirk. Instead, I was a bit taken aback at how often the book veered wildly in tone. There's some really funny bits in here, ones that genuinely provoked an outburst of laughter, but this is not a book that engenders relentless side-splitting fits. It often took me off-balance when James would shift between character POVs and you'd be plucked from the eyes of drunken Bradford into melodramatic Christopher's superficial woes. It results in a bit of thematically bumpy ride that I felt tough to get a hold on. Still, there's moments when the book soars with pitch-perfect transitions and well-timed comedic blunders. In particular, a party at the Widdicombe's transitions between party members with such fluidity that I found myself more drawn into the narrative by sheer readability. Indeed, James' writing is often quite pleasant, but occasionally falls victim to odd phrasing or verbosity seemingly for the sake of looking elegant. There's an equal amount of lines in the book that had me chuckling or nodding in appreciation as there were those that left me puzzled. I was also surprised to find out how much of the book is centred around the writing of not one, but two self-help books. Gracie's pursuit of instinctual happiness is contrasted with Frank's common sense approach to wellbeing. I think the intention here was both to lambast self-help authors and provide some self-help disguised as fiction. It makes for a bit of a weird read and I found these bits a little painful to work through. I'm all for characters finding their way through a life transition, but I don't think James quite stuck the landing with this duelling self-help approach. Cheer Up, Mr. Widdicombe is, for lack of a better word, weird. I know it's supposed to be odd and strange and satirical. The overall story seemed to be trying to hard to be something weird. Too much quirkiness and not enough story to balance it out. I didn't enjoy this book like I thought I would. It's too much oddness for my taste. Thanks to NetGalley for an arc in exchange for an honest review. I didn't finish this, I found none of the characters likable. I won this book in the giveaway! I absolutely adored the story, Evan James has a wonderful voice. I'm completely charmed. At first I wasn't sure what to expect but, as I got into the story I understood this is about the "idle rich". As you travel deeper into the lives of everyone you realize that they are just trying to discover "who" they are and what they need to feel good about their selves. This was more enjoyable than I thought, good reading. This book is trying desperately hard to be funny but comes off as brash and missed the mark entirely. I begin by saying this: I've been under a great deal of stress, ill relatives I'm caring for, lots of personal pressure, lack of sleep --- so I am 99% certain that any trouble I had with this novel is more about me than the novel. That said, I did not love this the way I thought I would, or, rather, the way I had been led to expect by pre-pub publicity and its blurbs. It was neatly constructed, well-written, had a sense of humor, but it wasn't really satire, and it wasn't really --- well, it was I begin by saying this: I've been under a great deal of stress, ill relatives I'm caring for, lots of personal pressure, lack of sleep --- so I am 99% certain that any trouble I had with this novel is more about me than the novel. Frank Widdicombe is suffering from depression, but only according to his wife, Carol, who also contemplates other things Frank may be suffering from. The Widdicombes are a wealthy family summering at their island home, Willowbrook Manor, on Bainbridge Island in the Puget Sound. Carol is planning a garden, created and cared for by Marvelous Matthews. Self-help author Gracie Sloane is going to spend the summer with the Cheer Up, Mr. Widdicombe by Evan James is a highly recommended satirical comedy. Thanks to NetGalley for the ARC of this book. I finished this book and said, out loud, "well, that was delightful." And I meant it. At about 20% in I wasn't sure I wanted to keep reading. At that point it felt a little tedious and I wondered why I cared about these privileged characters. The writing kept me going. Sparkling, whip-smart writing. Sure, overwrought at times, but it's satire, perhaps it's meant to be overwrought. The sentences are long, with many asides throughout, but it's a style I Thanks to NetGalley for the ARC of this book. "Hello, son," she said. Of course! Son. What could be more obvious and yet more unbelievable? That he should exist only in reference to those that created him, those that nurtured him and paid his way to survival - what better starting point for an act of subversive and provoking performance art? He would hang out with his parents, throwing himself completely into an exploration of sonhood, son-ness; he would spend the rest of the summer so artificially at ease with his family, so devoted to an exaggerated performance of sonhood that he would eventually surpass the so-called reality of son-ness and enter a realm of tongue-in-cheek filial abstraction, becoming a parody of a son. If nothing less, it would annoy his parents. On that he could depend." I mean, how could you not love this kid? My only gripe is with the Bradford character and his (view spoiler)[ loose ends. What the hell happened to him and with him? (hide spoiler)]. In the end, a summer with the Widdiciombes proved enticing, entertaining, and thoughtful. The commentary (read: satire) on life and family was all the more real for being a bit neurotic and exaggerated. And that writing. Wow. I received this book through Goodreads giveaway, so thank you very much to the organizers. The book presents a rich family, with some rich friends, as well as a few people who are less at ease financially. There is not much of a plot. The book is character-driven; the majority of it are inner thoughts and feelings of individual characters as they go through one summer together. Even the dialog often appears in the form of memories as a character is reflecting upon what happened. I thought that the I received this book through Goodreads giveaway, so thank you very much to the organizers. I thought that the idea of presenting the inner worlds of those in the upper one percent was original. I also liked the fact that there were references to what it took for them to be where they are now financially; that they weren't necessarily born into this. However, because at the start of the book they are already there, I found it difficult to relate to their various existential crises. I also found the format of the book somewhat challenging. Because it is focused so much on the inner world, much of the text is in long paragraphs with very little dialog. At one point, there is an entire speech given to an audience, which the reader is expected to read from start to finish, even if the topic may be quite eccentric. I wish there were more dialog for balance. As it is, sometimes it was difficult to stay focused through pages of block text. Overall, I enjoyed the book well enough. The characters were likeable, even if not always easy to relate to. There were some funny parts; there were a few emotional moments. But there wasn't much of a plot to balance the inner thoughts of characters. Also, I wish the book had a different cover, as this one made me somewhat uncomfortable and I couldn't read the book in public. Cheer Up, Mr. Widdicombe from Evan James is an enjoyable satirical read that succeeds quite well at entertaining the reader. I make that stipulation about being entertaining because that quality is often undervalued. I know I often do so when I enjoy a book but don't necessarily feel it added nuance or understanding to my world view. But some works are meant to entertain and should be assessed on that basis. 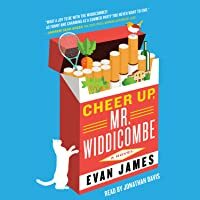 I did not immediately get into the book and put it aside for a couple of weeks to be able Cheer Up, Mr. Widdicombe from Evan James is an enjoyable satirical read that succeeds quite well at entertaining the reader. I make that stipulation about being entertaining because that quality is often undervalued. I know I often do so when I enjoy a book but don't necessarily feel it added nuance or understanding to my world view. But some works are meant to entertain and should be assessed on that basis. I did not immediately get into the book and put it aside for a couple of weeks to be able to give it a fresh start. With a better mindset toward it I found that I enjoyed it a great deal. There aren't major social or political comments here, though one could easily make some if desired. It was a fun, humorous, and sometimes mildly annoying (at some of the characters) novel that made me want to keep reading yet likely won't stay with me very long. I definitely recommend this to readers who want or need a fun novel to read with quirky characters and situations most of us will never even come close to experiencing. Just read it for fun, it will reward you if you do. This really is a fun summer party that I never wanted to end. It’s the type of book where, even if you’re having a bad day, you pick it up and a paragraph or two later your entire mood lifts into the clouds. I want to be part of the Widdicombe world! This is about an eccentric family and their friends in and around a scenic island off the coast of Seattle all trying to make sense of this crazy universe. Part self-help, part romance, all wild hilarity, this debut novel effortlessly hits every note. Cheer Up, Mr. Widdicombe has great bones: interesting characters, unique narration, quality backstory. But the storyline never gels. It has got a lot going on; there are seven main characters and a few periphery ones, which is not an issue, though the transitions are a bit abrupt. Although the story centers around the Widdicombe summer house and the characters flit in and out, the majority of the narration takes place within their heads, thus it reads like multiple thought bubbles floating about Cheer Up, Mr. Widdicombe has great bones: interesting characters, unique narration, quality backstory. But the storyline never gels. It has got a lot going on; there are seven main characters and a few periphery ones, which is not an issue, though the transitions are a bit abrupt. Although the story centers around the Widdicombe summer house and the characters flit in and out, the majority of the narration takes place within their heads, thus it reads like multiple thought bubbles floating about the characters with little context or gravity. It might work in a graphic novel or even as a screenplay, but as a novel, it makes for a choppy read. The quirky, satirical anecdotes are charming but Cheer Up, Mr. Widdicombe is best summed up by one of its characters; “What was she thinking about? Nothing, she said.” In the end, the story is much ado about nothing. Nothing can be humorous or even dark, but in this story, it is simply disappointing. Cheer Up, Mr. Widdicombe presents a somewhat meandering narrative that finds its charm in its cast of eccentric characters. Upon first impression, it is difficult to empathize with the wealthy Widdicombe family, who are all striving to find their purpose in the day to day banality of their lives. Having just moved to a new summer home on the Puget Sound, their life of luxury leaves them with little to occupy their time but respective despair- Frank is mourning the loss of a holiday in France, Ca Cheer Up, Mr. Widdicombe presents a somewhat meandering narrative that finds its charm in its cast of eccentric characters. Upon first impression, it is difficult to empathize with the wealthy Widdicombe family, who are all striving to find their purpose in the day to day banality of their lives. Having just moved to a new summer home on the Puget Sound, their life of luxury leaves them with little to occupy their time but respective despair- Frank is mourning the loss of a holiday in France, Carol is desperate to have her interior decorating recognized and their son Christopher is fresh off an international adventure which left him heartbroken. Despite their maudlin self-exploration, they find joy in the connection they have with each other as a family and in the company of the various people who surround their lives, including a wild self-help guru, Carol's level-headed but sentimental assistant, and a somewhat drug-addled screenwriter (to name a few). The reader can't help but celebrate with them as they each discover more about themselves and their purpose in life. Phenominally funny (especially the precise language of the first half). The fake self-help mantras were hard to get out of my head as I read on into Gracie's introduction, which kept the story well within my mind when not reading. Very grateful to have had the opportunity to meet the author in Kenya for the Summer Literary Seminars and very hopeful others will take the cue to pick up this book. It's a fun high-society snub akin to stuff I've read by Evelyn Waugh and Kingsley Amis. I received this book as a Goodreads giveaway. The focus of Evan James' novel outlines a summer with a family that’s so neurotic they’re almost normal. The characters are well constructed and the pace of the plot is well organized to keep you reading. In concussion I would say that If you like books about topics like family, friendship, and love this one is worth reading. Cheer Up, Mr. Widdicombe is a satirical novel about the antics of a rich and eccentric family one summer. It was entertaining summer reading, but without much plot. Probably my favorite characters were the people who worked for the family -- the gardener and the personal assistant. I received a free review copy of Cheer Up, Mr. Widdicombe through Goodreads Giveaways. Blistering satire of the hysterically trivial (and not so trivial) crises of a privileged family, their help, and a self-help guru (the guru's a mashup of Julia Cameron and Elizabeth Gilbert best I can tell) as they bumble through the summer of their discontent. This was just not the book for me. I'm not sure why I struggled to get through it. The characters were entertaining, but the plot seemed to drag on. I might have to revisit and see if I enjoy it any better. Started slow, but the characters were interesting and became well developed. Story felt a bit unfinished, but overall a good read. This book was very difficult for me to get through, but I still enjoyed it! I do have to warn folks that there are no chapters, which makes it a bit more difficult to pause while reading. A look into an absurd family dynamic and the people that revolve around them, Cheer Up, Mr. Widdicombe can be almost too self reflecting but makes up for it in comedic moments. What a lovely story! The characters were (mostly) like-able and their thoughts relatable! Evan James has a real talent!